PLEASE READ THESE INSTRUCTIONS IN FULL BEFORE COMPLETING THE FORM. 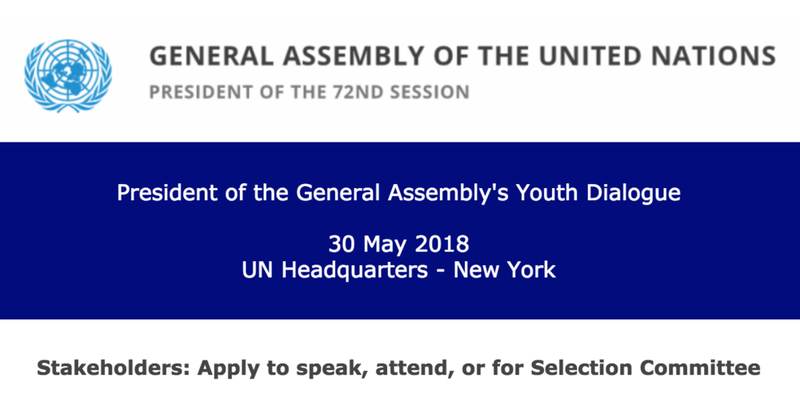 The President of the General Assembly is convening a one-day Youth Dialogue on Wednesday, 30 May 2018 at United Nations Headquarters in New York with the aim to discuss education, employment, and the prevention of radicalization leading to violent extremism. The format of the Youth Dialogue consists of an opening segment and two interactive chats in the morning, and a standing lunch and an “open mic” session in the afternoon. Additionally, there will also be an interactive space showcasing youth participation and empowerment. At the request of the Office of the President of the General Assembly (OPGA), UN-NGLS is facilitating a process to identify stakeholders to speak during the "open mic" session, and for stakeholders to apply to attend this event as observers. Travel funding will be available from the UN to support the participation of two of the selected stakeholder speakers in this meeting. The selected speakers will need to make their own visa arrangements, if needed for travel to the US, and cover the cost of the visa. Travel funding is NOT available from the UN to support the participation of stakeholder observers in this meeting. Representatives not selected for the speaking roles who are approved to attend the meeting as observers will need to secure their own funding for travel, accommodation and subsistence, and also need to make their own visa arrangements, if applicable. The United Nations cannot provide invitation letters to stakeholders approved to attend the meeting as observers. • has a visa for travel to New York, or is able to obtain one for travel to New York without assistance from the UN. Please check with the US Embassy or Consulate in the candidate's country or place of residence. The prospective participants would include representatives of youth-focused or youth-led organizations, networks or movements and have the ability to consult with a wider group of young people. • have internal democratic and transparent process of leadership, decision-making and consultation. UN-NGLS will facilitate a stakeholder Selection Committee for the evaluation and short-listing of the candidates for the speaking roles to be presented to OPGA for their consideration. The Committee will ensure regional and gender balance, and diversity of constituency and expertise in the overall set of candidates. The President of the General Assembly will make the final selection of the speakers for this event. Apply for speaking roles or to attend the event using the form below. Deadlines are at the top of this form. For the questions preceded by a # in the form, responses will not be made public.